Win Tickets to The Fabulous Food Show! 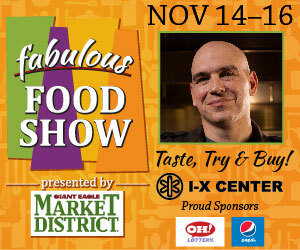 The I-X Center is proud to present the 9th annual Fabulous Food Show, November 14-16! Appearing live, with 100 demos on six stages at the Fabulous Food Show presented by Giant Eagle Market District: Mark DeCarlo, Martie Duncan, Tyler Florence, Carla Hall, Ingrid Hoffman, Nadia G, Jason Roberts, Michael Symon, and more! 450 companies sampling & selling for the holidays, wine, beer and spirits tastings, food trucks and live music. New this year: Local Roots Artisan Pavilion, Healthy Living Pavilion presented by Vitamix, Block Party hosted by Michael Symon and Salsa Fiesta! with live music and a salsa dancing competition hosted by Ingrid Hoffmann. Don’t miss the biggest culinary celebration in North America at the I-X Center! General Admission Tickets on sale now at Giant Eagle, Giant Eagle Market District, Discount Drug Mart and fabulousfoodshow.com. Also available, reserved chef seating and VIP experiences which allow you to get up close & personal with your favorite celebrity chefs! Follow the Fabulous Food Show on Facebook at facebook.com/fabulousfoodshow for information on special giveaways ranging from tickets to the show, a Vitamix Blender and a Caribbean vacation! ← Horrible Bosses 2 Giveaway! !